Time for another gaming diary, one that will span multiple updates. As stated in the last post, my thirst for medieval warfare has been rekindled and so, I now set out to conquer the known world as portrayed in the Medieval 2: Total War-mod “Lands to Conquer”, playing as the Holy Roman Empire (aka. The HRE). Most people familiar with the game know that the vanilla AI isn't very bright. 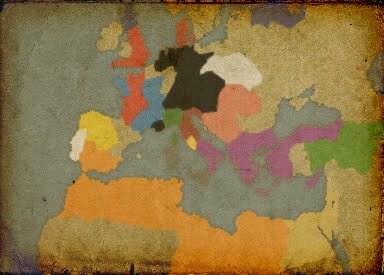 Besides improving on this, the mod also rebalances the world, making it a bit more historically accurate and at the same time a bit more challenging. This particular mod stays quite close to the original and doesn't make any changes to the areas of the map, although it does distribute then a bit differently. Most of the work done lies in the rebalancing of the units. For more about the differences please visit this link. Why the Holy Roman Empire? In short: Because of the potential for challenging game play as well as drama. The situation of the HRE at the start of the campaign (beginning in the late 11th century) is quite interesting: The empire covers vast tracts of land located in the heart of Europe and is surrounded on all sides by Christian monarchies. At the time, the Holy Roman Emperor is not highly thought of by the Pope after the Investiture Controversy . This is translated in the game as the Papal state being at war with the HRE along with a minimal rating by the pope. Any aggressive behaviour towards the aforementioned neighbours can be expected to result in an excommunication, effectively limiting expansion on the home front. This home front is, of course, rather large. To guard these borders can be a costly affair as the wide spread nation prohibit the use of a larger centralised defence force. With better part of the realm land locked, trade routes are of lesser value than those of, for example, the regions of the Italian peninsula. If the mod reflects history well enough there should be some trouble keeping the already existing empire together as well, since in reality it was a hodge-podge of states, territories and free imperial cities. A plethora of revolts and uproars could and should plague the reign of Coin, further adding to the excitement. I thought it could be fun to try something new, so this gaming diary will be written in the style of a chronicler at the court of the Holy Roman Emperor. The chronicler will have full access to the Royal archives as well as the meetings of the Council of Lords and should be able to give full account of the proceedings. I'll be using modern language to make things easier on both writer and reader but try to add enough flavour to make it interesting.